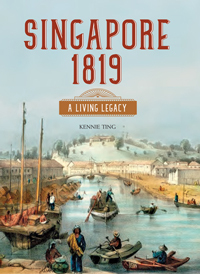 The story of modern Singapore as told through its living heritage is encapsulated in this handsome book, published to coincide with the 200th anniversary of Singapore’s founding as a city-state. Today’s vibrant, cosmopolitan country developed a singular identity through the many colourful ‘ingredients’ outlined in this book. Starting with the founding of modern Singapore by Sir Thomas Stamford Raffles, we review the many events, people, artefacts, legends and lifestyles pre- and post-1819 that contributed to make Singapore the unique city it is today. This is the first book to encompass all aspects of Singaporean heritage — be it artistic, cultural or natural heritage. Historic personages, monuments, architecture and the arts, cultures and traditions, and flora and fauna are all covered in their many facets. The book showcases how much of 1800s and early 1900s Singapore remains today, thereby presenting a lesser-known side to the city-state — one that is surprisingly historic and richly evocative, a different face to a place more often associated with a stark modernity. Insightful, lively texts by museum director and heritage expert, Kennie Ting, are accompanied by archival images, contemporary photographs, maps and more, to present a comprehensive picture of the city-state — past and present. The author and publisher would like to thank our readers for referring the following errors in this First Edition to us. “Overseas Chinese Banking Corporation (OCBC)” should read “Oversea-Chinese Banking Corporation (OCBC)”. “I M Pei’s Overseas Chinese Banking Corporation Tower” should read “the I M Pei – designed OCBC Centre”. “Major Farquhar (1774–1839; residency 1819–1923)” should read “Major Farquhar (1774–1839; residency 1819–1823)”. “Dr John Crawfurd (1783–1868; residency 1823–1823)” should read “Dr John Crawfurd (1783–1868; residency 1823–1826)”. “St Joseph’s Institution (Singapore’s first Catholic school, 1843)” should read “St Joseph’s Institution (Singapore’s first Catholic school, 1852)”. “Church of Saints Peter and Paul (1969)” should read “Church of Saints Peter and Paul (1869–1870)”. “early 19th century” should read “early 20th century” in both captions.